We wouldn't be caught Dead with out ours. 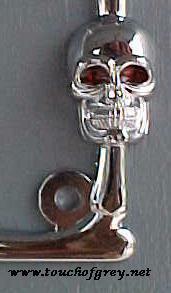 The Skull and Bones License Plate Frames are constructed from Die-Cast Metal and are Chrome Plated. 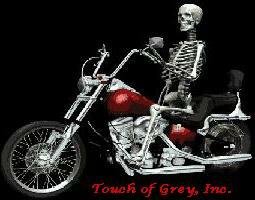 The plate frame is in the shape of bones with a skull located on the lower left and lower right of the frame. 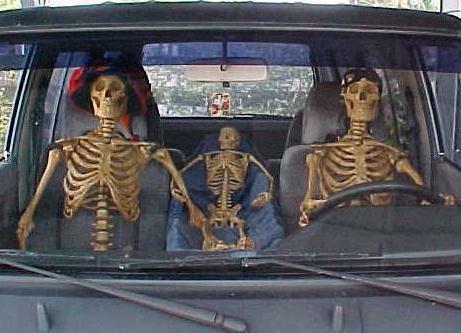 Each Skull has red jeweled eyes. The outside dimensions of the frame are 12" x 6 1/2". Bolt holes are 7" center to center. 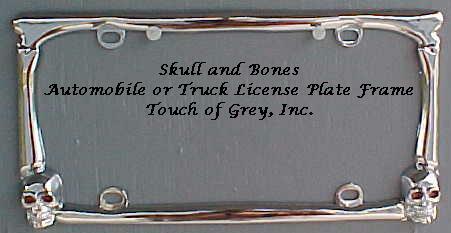 The Skull and Bones License Plate Frames are $12.00 each plus shipping. Shipping for one license plate frame is $6.00 for a total of $18.00 in the U.S. Please E-Mail us for stock availability before placing an order. 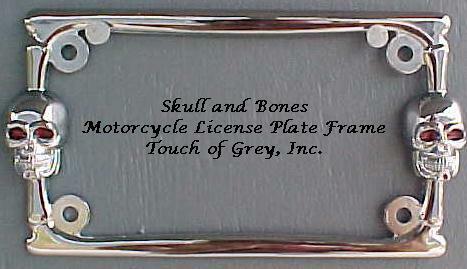 The Motorcycle Skull and Bones License Plate Frames are constructed from Die-Cast Metal and are Chrome Plated. 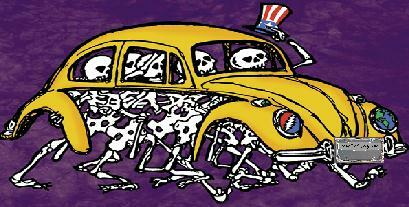 The plate frame is in the shape of bones with a skull centered on each side of the frame. 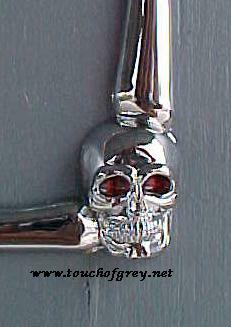 Each Skull has red jeweled eyes. The outside dimensions of the frame are: 8" Skull to Skull. Bones to Bones 7 3/8" x 4 1/4". Bolt holes are 5 3/4" center to center. These Plate Frames are $12.00 each plus shipping. We accept Money Orders or Checks. Credit Cards are accepted through PayPal only.